Computer security experts will definitely tell you that Discovery App is a potential security threat, and you should not install it on your system. The program is an adware application, and as such it can and will be used to generate money for its creators. The program needs to cover its development cost by profiting via the pay-per-click system. However, this could easily result in a malware infection, and that is why it is for the best to remove Discovery App right now. Do not keep this program just because it says it can help you improve your web browsing experience. It does not. The official homepage for Discovery App is located via ratediscoverymarket.com. Usually, it should be possible to download an application from its official site if it has one. However, that is not the case with Discovery App. In fact, the website is too generic to offer any kind of useful information for you. It is obvious that it has been made for the show, to make you think that Discovery App is a legitimate application that you can trust. Unfortunately, that is very far from the truth, and it is easy to see when we take into consideration the program’s distribution method. Discovery App travels around in software packages. The program is bundled with other freeware and adware programs by third-party installers. Users often do not know that they install Discovery App on their computers because they are too focused on some other application. Perhaps you have installed some program from a file-sharing website recently? Have you checked all the installation steps through and through? If not, this could be the reason you are seeing so many pop-ups and other types of advertisements when you browse the web right now. All these ads are generated by Discovery App. This program comes from a prominent family of adware applications, and it is another version of Sale Charger, Assist Point, Positive Finds, Roaming Rate, and others. 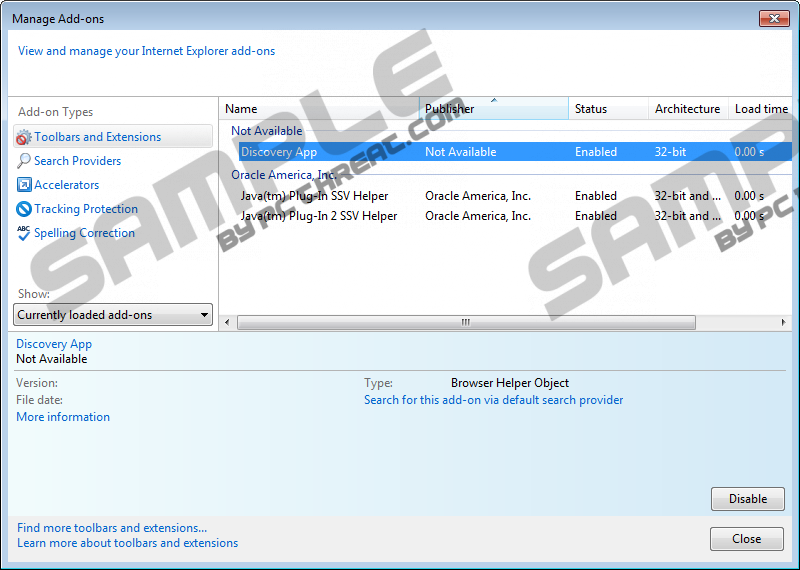 All of these programs are based on the Injekt engine, and they are somewhat similar to the SuperWeb adware, although the files are signed by a different entity, and the overall framework of the program is somewhat different. Nevertheless, the similarities lie in the fact that Discovery App also adds an extension to your default browser, and this extension monitors your online activity. Adware programs make use of browser extensions to track which websites you visit and what you usually search for. Discovery App and other similar applications need to collect as many information about your online habits as possible because they need to generate your online profile. With all the data at hand, the program can create a flow of customized commercial advertisements, all of which will be targeted at you. You will do yourself a favor if you stay away from clicking those ads. Please bear in mind that the adware program does not check whether the outgoing links embedded in the ads are safe. Thus, if you happen to click any of the ads, you could be redirected to a dangerous site and then get infected with malware. Remove Discovery App right now via Control Panel and avoid all the potential malicious threats. To ensure your system’s safety, scan your PC with the SpyHunter free scanner. Highlight Discovery App and click Uninstall. Select Uninstall a program and remove Discovery App. Go to Add or remove programs and uninstall Discovery App. Quick & tested solution for Discovery App removal.